Hey, why not – they let Catwoman join for a while. 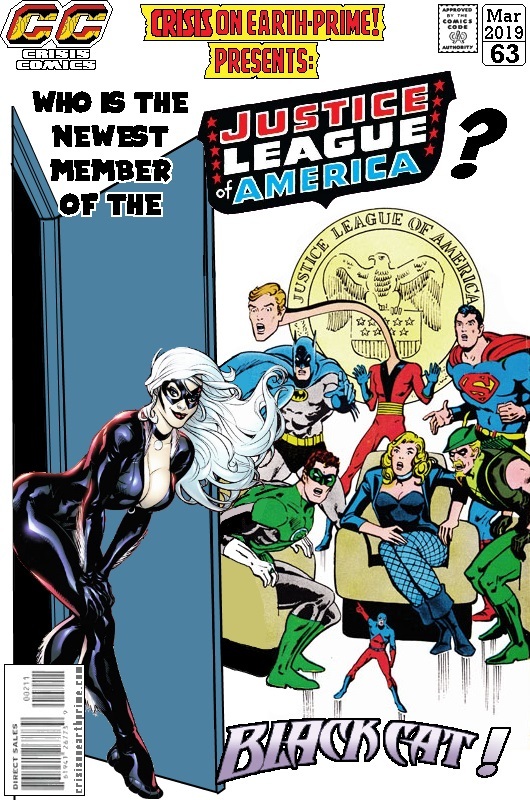 Posted on Wednesday, March 27, 2019 Tuesday, March 5, 2019 by GaryPosted in Mash-UpTagged Atom (Ray Palmer), Batman, Black Canary, Black Cat, Elongated Man, Green Arrow (Oliver Queen), Green Lantern (Hal Jordan), Justice League, Superman. Huh. Interesting. You just know she’s going to put the League’s defenses to the test by trying to steal stuff. She’s a natural born Klepto; she just can’t help herself. Yeah, and can you imagine Green Arrow’s reaction to her? Yeah, goo-goo eyes, followed by him hitting on her, followed (possibly) by sleeping with her, because Ollie.